Like so many prescription stories, this one starts with a visit to the emergency room. Brian Kraus was driving back from work in his MG Midget when he was rear-ended—the driver was too busy playing with the radio to notice the fully stopped, bright-orange MG. Even though Brian and the 1976 Midget had gotten off to a rocky start before the accident—the car actually broke down during the initial test drive—he was determined to stick with it. While they didn’t set off on the best of terms, Brian still saw the potential for a neat British sports car. At the time of the accident, the Midget was actually undergoing a rolling restoration; the collision merely sent things off in a more radical direction. “After doing some research, I found that the Mazda rotary motor should be a good fit,” Brian says, referring to the compact twin-rotor Wankel engine found in the Mazda RX-7. He was attracted to the diminutive size, light weight and high power output of the 13B-series Mazda rotaries; the fact that a five-speed transmission would be part of the package sealed the deal. The prescription for an RX-Midget was in his hand; getting it filled would be the challenge. 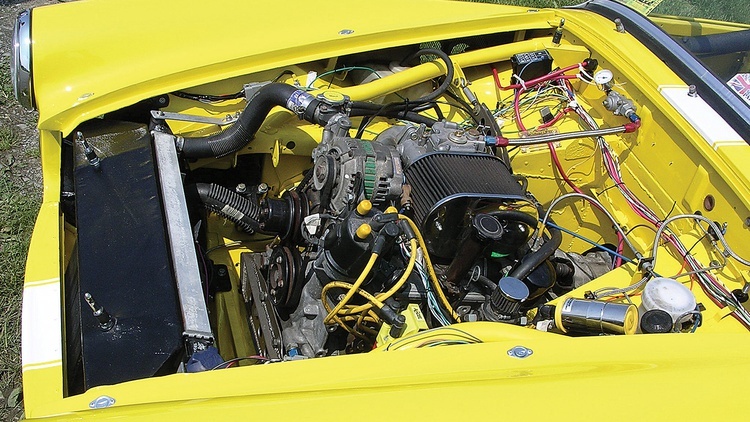 “I ended up finding a 1986 motor and transmission at the junkyard and bought it, not knowing what I would have to do to make it fit,” Brian says. It turns out that a slightly earlier design was going to fit better. Swapping out the front cover, oil pan and oil pickup for parts sourced from a 1984-’85 Mazda RX-7 GSL-SE’s engine solved the problem. “This allowed me to make a front mount that fit nicely in the Midget’s engine bay,” Brian explains. In stock trim, a 1986-vintage Mazda 13B rotary makes 146 horsepower and 138 lb.-ft. of torque, a significant jump over the 1976 Midget’s stock 55 horsepower and 67 lb.-ft. of torque—and the gain in power comes without a real weight penalty. Brian had the engine built and ported for street use by RP Performance in Manassas, Va. When Brian was test fitting the engine, he realized that the unibody and the intake manifold both wanted to occupy the same place. To solve this problem, he removed a small part of the body and then welded in a boxed section to maintain structural integrity. Next, the Mazda fuel injection setup stuck up too far and hit the hood. To solve this problem, Brian scrapped the Mazda setup in favor of a Racing Beat intake manifold mated to a Weber 48DCO side-draft carburetor, an arrangement that hugs the top of the block neatly. On the exhaust side, he fabricated a header with long primary tubes. The piece was then treated to a Jet-Hot 2000 coating. He then mated the 1986 five-speed to the tailshaft housing and shift rod ends from a 1984 Mazda B2000 pickup truck. A custom mount was needed to secure the transmission inside the small, stock tunnel. A universal wiring harness from E Z Wiring exorcised any electrical demons from the MG. The Mazda 13B easily tripled the Midget’s stock horsepower; it was time for Brian to look at the performance potential of the rest of the car. “The stock Midget ran 13x4-inch wheels and 165-size tires,” Brian says. “Not exactly what you want to put power down with.” Armed with a far more potent engine, the Midget would need a footprint to match. A wider wheel and tire combination was the primary goal, and that would mean flaring out the fenders; the wheels would also need to be larger to accommodate bigger brakes. During a visit to the Import Carlisle show in Pennsylvania, Brian came across Spridgetech, a company that specializes in composite body parts for Midget and Austin-Healey Sprite race cars. “They carry a set of lightweight fiberglass fenders and hoods that would give me the room I needed for wider wheels,” Brian says. “After test-fitting the fenders, I found that 15x8-inch wheels would fit very tightly in the wheel wells.” Some quick math revealed that a 225/50R15 Kumho V700 Victoracers tire should also work in the new fender. Finding Superlite wheels with the proper offset and bolt pattern took some doing, but Brian finally tracked down a set that had been specially ordered but never picked up. With his footprint set, Brian went about attaching it to the car in a meaningful way. “After spending several days researching different designs and using CAD software to design a rear suspension, I had something I liked,” Brian says. His plan was to remove the heavy stock leaf spring setup in favor of a more elegant solution using Mazda components. “I purchased a used GSL-SE rear and took it to Jim Robinson Racing to have the axle housing narrowed to fit under the Midget,” Brian explains. “The axles were sent out to Moser Engineering to be cut down and re-splined.” After a few days of welding, Brian had a four-link suspension mated to a narrowed Mazda rear axle, with everything suspended by shortened and inverted Doetsch coil-overs with 110 lbs./in. springs. A 5/8-inch adjustable anti-roll bar links the two sides. For the front suspension, Brian found most of the things he needed at The Winner’s Circle, another Spridget specialty shop. Negative camber bushings, a 3/4-inch front anti-roll bar, 340 lbs./in. springs and some Nylatron bushings firmed up things considerably over stock. Brian revalved the stock dampers in front to control the higher rates. 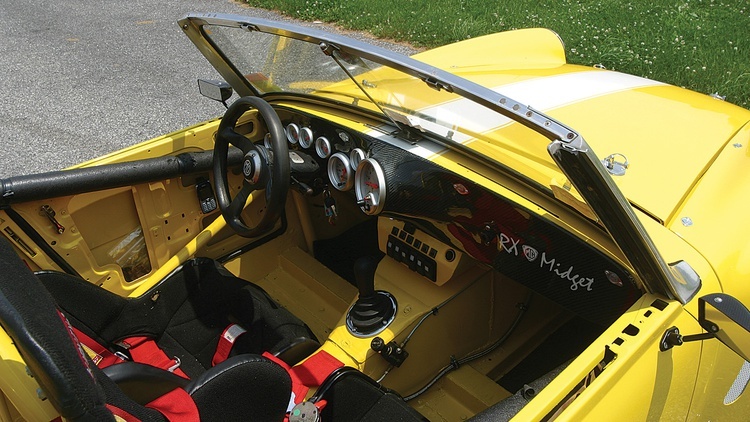 “I built the roll cage as the car was being built,” Brian says, “so that I could connect important suspension parts to it, to keep the car stiff and prevent the unibody from flexing.” Elements include a front bar under the dash and a larger rear roll bar that stretches over the driver and passenger. 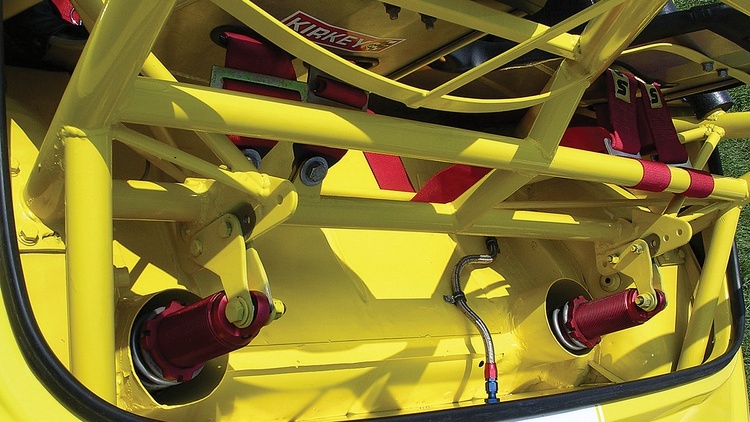 “The [front and rear] roll bars are connected to each other with door bars that triangulate and brace the structure and the loads from the suspension,” he adds. While a stock MG Midget makes the run from zero to 60 in a bit more than 15 seconds, Brian’s G-TECH/Pro said the car now needed a little more than 4 seconds to accomplish that same feat. The car may not have looked beautiful, but it was undeniably quick, scoring Brian the Metropolitan Washington Council of Sports Car Clubs 2001 autocross championship, a silver medal with his local D.C. region, and a number of top times for the day. It took Brian about a year to smooth the body to his specifications before it was ready for paint. “The final body work and painting was done by Winning Finish in Littlestown, Pa.,” Brian says. 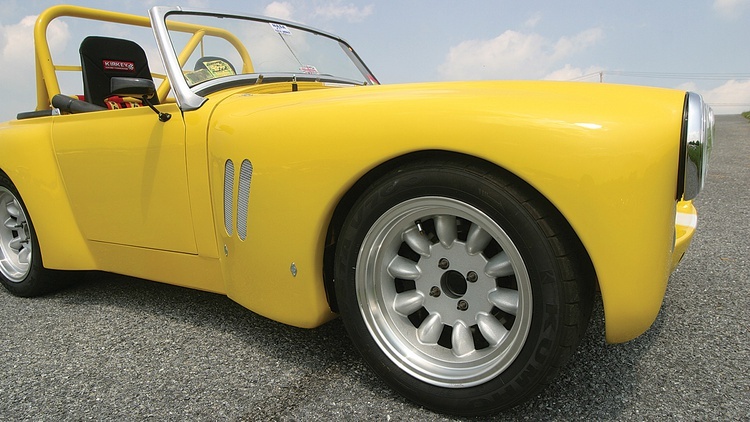 A pair of PPG colors—Bright Yellow and Performance White—give the car its bold appearance. Paint was applied inside and out so the car would look sharp even without carpets. 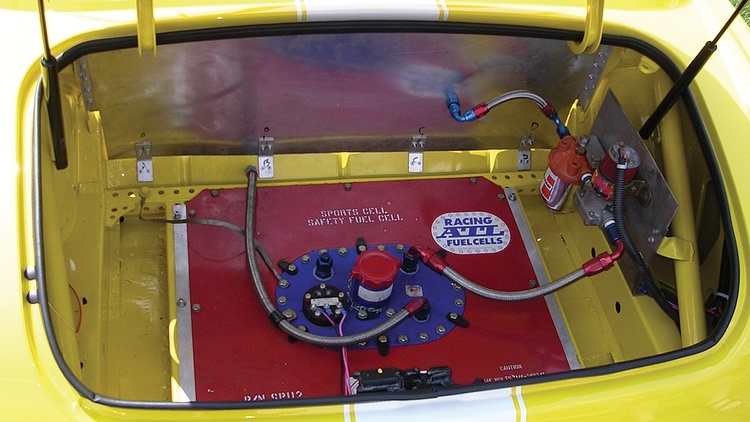 Brian needed a home for the Auto Meter Ultra-Lite gauges, so he designed and built a fiberglass dash. Brian then turned to Mark Koch at CarbonFiberParts.net, and had Koch cover the fiberglass in carbon fiber. It took seven years, but Brian’s RX-Midget is now the total package, mating world-class power and handling with stunning looks, all for a relative bargain. 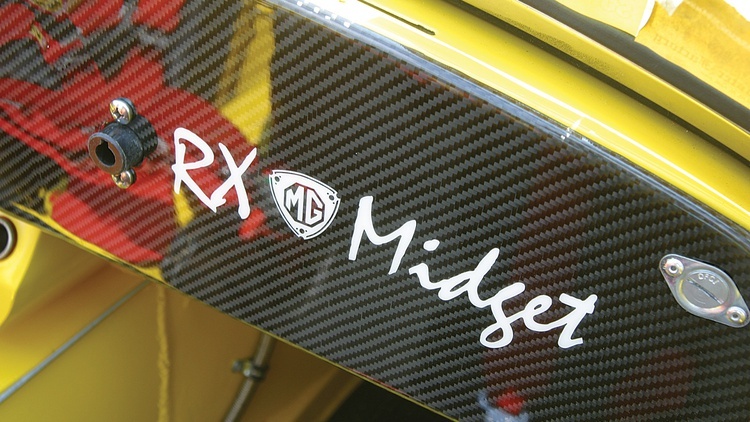 “Since the car has been finished, I’ve been asked several times if I would sell the RX-Midget,” Brian says. “She isn’t for sale. Everything is just the way I want it on the car, from the position of the controls to the design and style of many of the fabricated parts I made. Lightweight roadster with Mazda 13B rotary power is a great combo. If you want such a beast without having to do the conversion, I'd suggest considering the 1992-93 Maxton Rollerskate roadsters. http://www.maxtonrollerskate.com/ About 50 were made, some sold in kit form but most were sold completed, all with 12A or 13B rotaries. Typically they change hands now in the mid/upper teens, though I saw a nice one sell for $12K a couple years ago and have seen as much as $25K bid and no-sale on a brand new condition super low mile car recently, so there is quite range. I own #19, one of less than 10 long-wheelbase cars, running a ported 13B, MicroTech LT-9c and fuel injection. I also added the later RX-7 rear with discs and LSD just like the owner of this MG. With over 200 horses and weighing only 1700 lbs. it is blast on local back roads. I've got nearly the exact same car and engine combo waiting to be finished. I've seen this car before and already stolen some of the suspension ideas from it. Great to see a more in depth article. Great build! This is a well documented winning combination on the national autocross scene. Bob and Charlotte King won multiple E-Mod national SCCA championships in their rotary Midget. Looks like your heading toward the same kind of record. Congratulations! A guy from the Little Rock area brings a Midget to our car show regularly. It has some kind of Dodge 4 cylinder in it. Then a big bottle of NOZ, then a turbo. Running MegaSquirt. Year before last he mentioned getting a speeding ticket in triple digits.